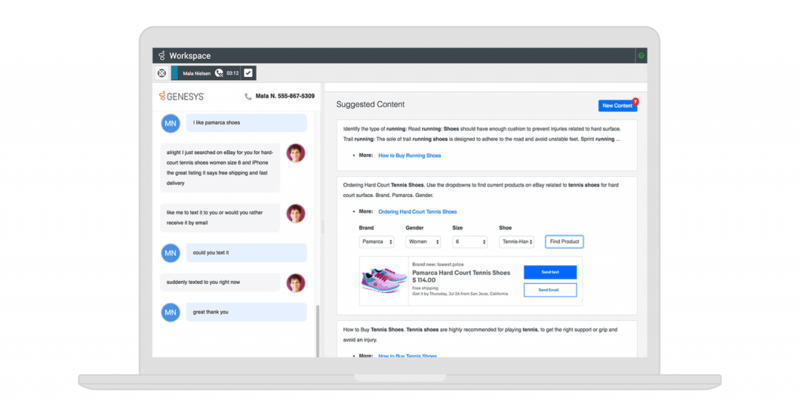 Google and Genesys have partnered, so you can deliver new world-class customer experiences—blending AI and Google voice interaction technologies with Genesys call center automation and predictive routing. See how customers can contact their favorite brands using chat or mobile messaging apps, and easily ask for help with basic questions—or even transactions. Managing a customer’s AI transactions is easy, and you can blend AI with human interactions for more complex situations. Watch the video to learn how to use blended AI to deliver faster, more effective customer experiences. Bot technology isn’t new. But, in the past, it took months to deploy. These new advancements get you up and running in mere days. The Blended AI by Genesys approach means your customers always have a way to reach a human agent—and those call center agents are smarter and faster. All the information collected by the AI assistant regarding history, intent and predicted next steps is summarized in the agent workspace as part of the transfer. *Must already be a Genesys customer to participate. Deliver effective natural language processing over many channels – phone calls, web chat, mobile messaging, smart speakers. Use AI to train new interactions in days, not months. Deliver exceptional, connected experiences where customers get answers directly, quickly and easily, anytime and anywhere. Comprehensive, 24/7 support maximizes voice channels by enabling off-hour use with scheduled callbacks during business hours.